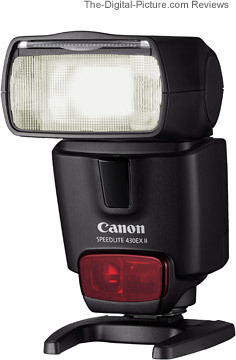 Amstelveen, The Netherlands, 10 June 2008: Canon today announces the latest addition to its EX Speedlite flash unit range, the Speedlite 430EX II. A highpowered compact flash, the Speedlite 430EX II has a guide number of 43 (m/ISO 100 at 105mm) and an inbuilt wide panel to allow coverage suitable for wide angle lenses to 14mm. Replacing the Canon Speedlite 430EX, the Speedlite 430EX II offers fast, silent recycling and full control via the menu system of compatible EOS cameras. It is ideal for both amateurs and professionals seeking a versatile, all-purpose flash. For maximum flexibility and ease of use, the Speedlite 430EX II incorporates a number of new features. Recycle times have been reduced by approximately 20%, with the recycle process performed silently to minimise distraction. A new metal mounting foot with redesigned connection pins provides ultra-stable communication between the camera and flash; for rapid connection to the camera, a new quick release and locking mechanism is also incorporated. Used in Manual mode, the Speedlite 430EX II offers settings in 1/3 stop increments for increased precision of operation. Plus – when used with compatible EOS cameras – every setting on the Speedlite 430EX II can be controlled via the camera menu system, allowing rapid, intuitive alteration of settings. The Speedlite 430EX II is a key component of the integrated flash system for both analogue and digital cameras, and is fully compatible with the distance-linked ETTL II system found on recent EOS cameras. It can also be used as a slave unit when combined with a master unit in a wireless flash setup. Slight variations in a flash gun’s voltage and brightness can destabilise white balance in respective frames during continuous shooting. The Speedlite 430EX II compensates for this by transmitting colour information from the flash to the camera. This information is then used to optimise the white balance setting for each individual image. This function works with the camera set to Auto WB or Flash Mode. When mounted to compatible EOS digital cameras, the Speedlite 430EX II detects whether the sensor is full frame, APS-C or APS-H. The flash’s zoom position is then automatically adjusted, optimising flash coverage and the amount of charge needed per shot. Other features on the Speedlite 430EX II include 1st and 2nd curtain flash synchronisation, exposure compensation, and an expanded range of nine custom functions. The Speedlite 430EX II can be used with the following optional accessories: the Canon OC-E3 off-camera shoe cord and the Speedlite bracket SB-E2. Featuring a handy quick release/locking mechanism, the OC-E3 adds wired, short-range positioning flexibility to the Speedlite 430EX II. The Speedlite bracket SB-E2 is designed specifically for wedding and press photography and allows the Speedlite 430EX II to be mounted to one side of the camera – removing the harsh, unnatural shadows that can occur to one side of the subject when shooting in portrait orientation with a camera-mounted flash.